If you’re using our Guide to Camping on the West Highland Way in conjunction with our guide on how to navigate on the West Highland Way you’re well on your way to a fantastic WHW adventure! You’ll have your itinerary mapped out, with knowledge of where you’ll stop each day and you’ll be expertly using your smartphone’s GPS to stay on track. However, how will you know just how far you are from your next stop? Many of the campgrounds aren’t well marked on the GPS base maps and you’ll certainly want to know how much longer you have until you can drop your pack. As a resource for our West Highland Way series we thought it would be useful to provide downloadable GPS waypoints for all of the campgrounds included in our guide that work seamlessly with the Gaia GPS app! Keep reading to learn how to download this data and use it with our guide to navigating on the West Highland Way. Get our Complete Guide to Camping on the West Highland Way for only $4.99 USD! All payments are securely processed via PayPal and your guide will be sent directly to your inbox. Save yourself the trouble of searching all over the internet and get access to everything you need to plan your adventure in an easy to read guide. All for only $4.99! First, you’ll open the Gaia GPS app and select the ‘Create’ button in the top right corner. 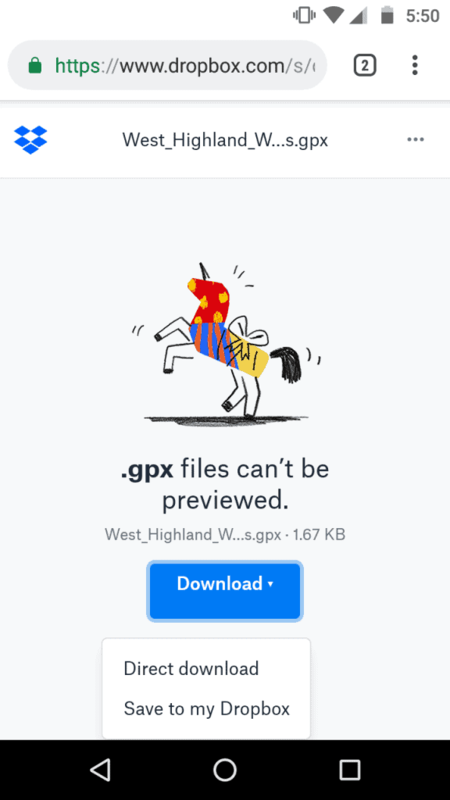 From here you’ll select ‘Import file’. Next you’ll need to navigate to your ‘Downloads’ folder, or whichever location you saved the .gpx file to. This was a bit tricky to locate for me, but I was able to find it in the ‘sdcard’ folder. From here, Gaia GPS will recognize any files that are compatible, including the West Highland Way Campground locations file. Select the file and the Gaia GPS app will import the location data. Give your phone a moment to import the data and voila! You should now have all of the campgrounds that are included in our Guide to Camping on the West Highland Way saved on your phone! Now when you’re out on the trail, you can see exactly how far you have to go until your next stop, and be able to easily find your campgrounds at the end of the day. 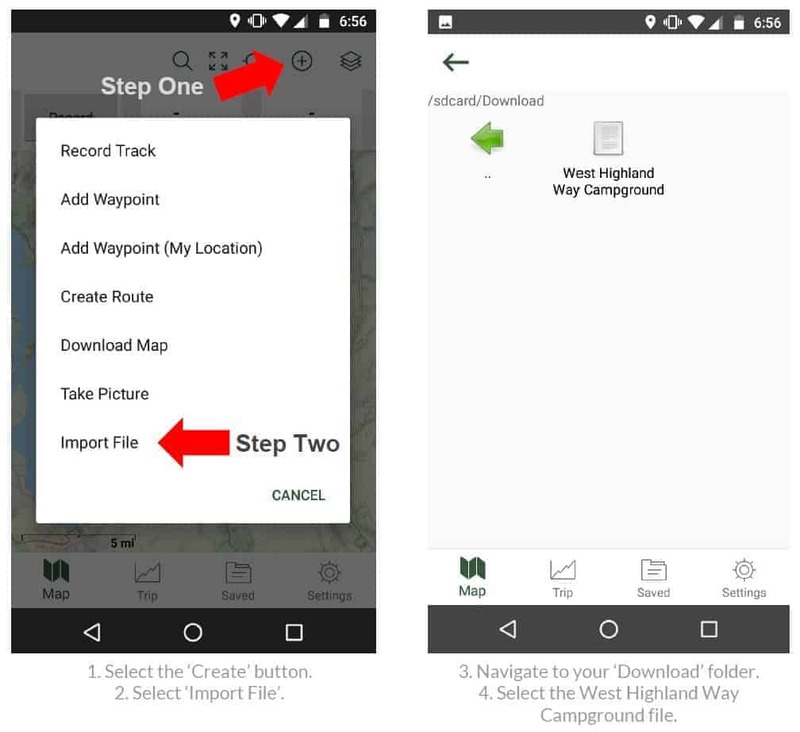 The instructions above give you a step-by-step guide for importing the West Highland Way campground location data into Gaia GPS on Android. We happen to both use (and love) Android phones, but know that many readers will have iPhones and want to know how to import the file to their phones. Rest easy because the process is even easier on iOS! 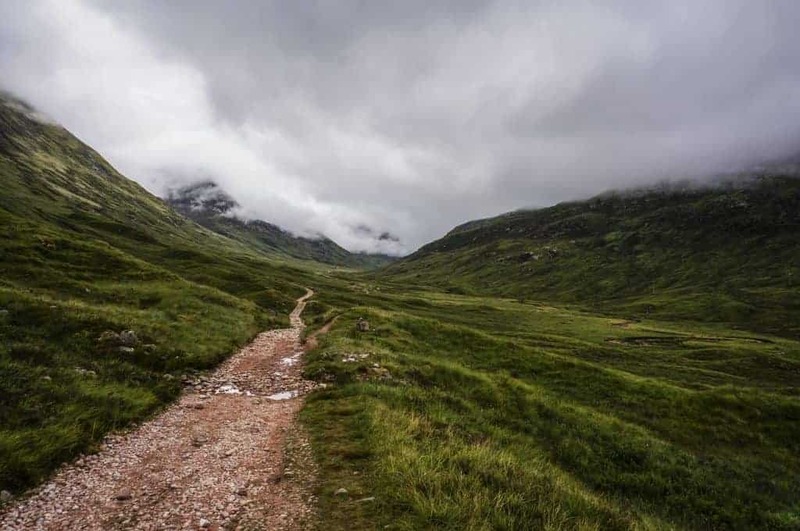 Be sure to read our entire series on the West Highland Way to learn everything you’ll need to know to prepare for your trip!